Spectacular Bride features wedding photography by Ella Gagiano Studios at the captivating Bear’s Best Las Vegas. Summer is in full swing and we have an absolutely breathtaking wedding that is as dreamy as those Las Vegas sunsets! As featured in Spectacular Bride Magazine, Ella Gagiano Studios and event planner, Tory L. Cooper teamed up at Bear’s Best Las Vegas to capture this stunning wedding setting. 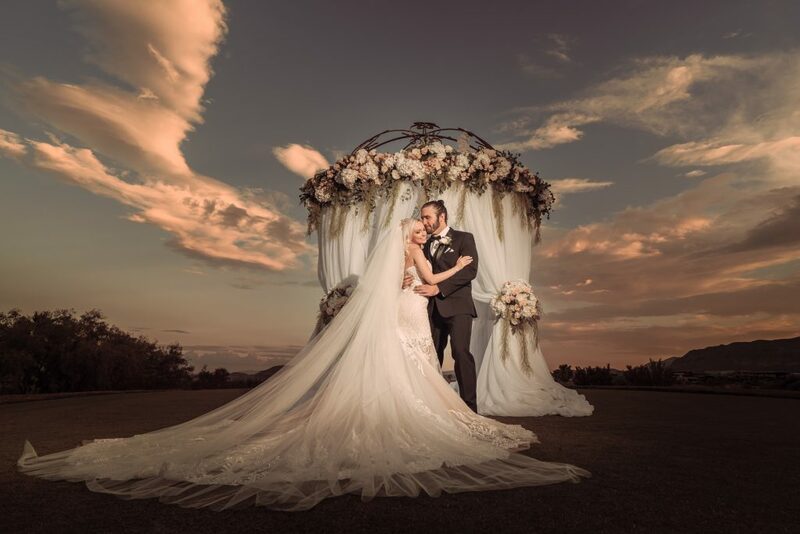 Photographed on the pristine golf course with sweeping views of the gorgeous Las Vegas sky, this bride and groom said, “I Do” under a beautifully styled altar adorned with snow-white drapery and cascading floral arrangements. For the reception, they chose an elegant table setting with white sequence table linens, gold cutlery, and rose-centric centerpieces surrounded by high and low ivory candles. To top off this picture-perfect wedding, a gorgeous white stallion joined the bride and groom as they posed for their wedding photos. With a dreamy wedding like this, this is certainly more than just summer love — enjoy! Horse: MB’s Horse & Carriage Co.
« Glam or Sweet — What’s Your Favorite Bridal Style?